Herbs, annual, cespitose. Culms to 30 cm, bases soft. Leaves spreading to ascending, ¼-1/3 length of scapes; sheath borders tan, backs prominently ribbed, glabrous; blades filiform, 0.5 mm wide, involute, margins ciliate-scabrid, surface glabrous. Inflorescences solitary or more commonly in simple, open, rarely compact, involucrate anthelae; scapes filiform (rarely with several spikelets sessile or subsessile at plant base), prominently ribbed, glabrous; proximalmost involucral bract cuspidate or setaceous bladed, exceeding or exceeded by inflorescence. Spikelets red-brown, ovoid to lanceoloid, 3-5 mm; fertile scales ovate, 1.5-2 mm, apex acute, glabrous or distally puberulent, keel prominent, short-excurrent. Flowers: stamens (1-)2; anthers oblong-elliptic, 0.5-0.7 mm. Achenes yellowish to pale brown, trigonous-obovoid, 1 mm, faces rugose. 2n = 84. Fruiting summer-fall. Sandy savanna, prairie, arenaceous outcrops, sandy or gravelly waste areas; 0-3000 m; N.B., N.S., Ont., Que. ; Ala., Ariz., Ark., Calif., Conn., Del., D.C., Fla., Ga., Ill., Ind., Iowa, Kans., Ky., La., Maine, Md., Mass., Mich., Minn., Miss., Mo., Nebr., N.H., N.J., N.Mex., N.Y., N.C., Ohio, Okla., Pa., R.I., S.C., Tenn., Tex., Vt., Va., W.Va., Wis.; Mexico; West Indies; Central America; South America; Asia; Pacific Islands. 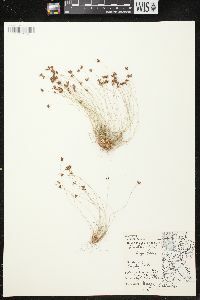 A specimen of Bulbostylis capillaris collected by E. Hall (#585) gives Oregon without a specific locality. Bulbostylis capillaris is distributed over a broad range of physiographic types and occurs in many forms, the most distinctive of ours being var. crebra, which has, in addition to numerous long scaped anthelae, large numbers of spikelets at the plant base. 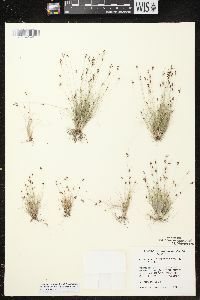 Annual herb with very thin, widely dispersed roots, tufted to 30 cm tall Leaves: basal, spreading to ascending, much shorter than culms, to 0.5 mm wide, thread-like, ribbed, curled inward at the margins, with a sheathing base that encloses the stem, laterally tuft-hairy at the junction of the blade and sheath. Sheaths opening at the apex and ribbed on the backside. Inflorescence: a solitary spikelet or an open anthela of two to seven spikelets subtended by thin, more or less leaf-like bracts (an anthela is a type of inflorescence which bears lateral branches that are longer than the main axis). Flowers: minute, subtended by a floral scale, lacking sepals and petals. Stamens two, exserted. Anthers two, about 0.5 mm long. Pistil one. Style three-cleft. Fruit: a one-seeded achene, yellowish to light brown, about 1 mm long, reverse egg-shaped and three-angled, wrinkled. Tubercle minute. Seed with a thin, non-adherent wall. Culm: thin, unbranched, to 30 cm long, triangular in cross-section, solid, ribbed, basally soft. Spikelets: reddish brown, 3 - 5 mm long, egg-shaped to lance-shaped with a pointed tip, bearing a few floral scales. Scales spirally arranged and overlapping, 1.5 - 2 mm long, egg-shaped with a pointed apex that often bears a short continuation of the midrib, keeled. Habitat and ecology: Dry or moist sandy soil, often in disturbed areas with little competition. Etymology: Bulbostylis comes from the words bulbus (bulb) and stylus (style). 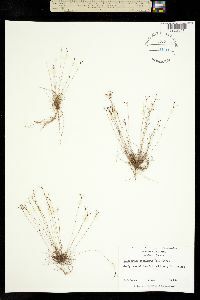 Capillaris means hair-like. I have the typical form of this species from Elkhart, Kosciusko, Lagrange, St. Joseph, and Starke Counties. The map shows both the typical form and the variety [var. crebra]. This plant is infrequent in the northern part of the state and rare in the southern part. It is found in very dry, sandy soil, usually in fallow fields and clearings, on open, sandy knolls and dunes, and the variety [crebra] sometimes in residual soil on the crests of sandstone ridges and on cliffs. Variety crebra has the same habitat as that of the species [Bulbostylis capillaris] and ranges throughout the state. Only thorough field study will convince me that this variety is distinct in Indiana. Tufted annual to 3 dm; scapes capillary; lvs short, slender, to 0.5 mm wide, involute, smooth or with scabrous margins; spikelets lance-ovoid or ovate, acute, 3-5 mm, few-fld, 2-7 in open, umbelliform cymes; scales ovate, curved-keeled, with a prominent, often shortly excurrent midrib; anthers 2, 0.5 mm; achene obovoid-trigonous, 1 mm, stramineous, finely cross-rugulose; tubercle minute, depressed-globose. Dry, open, often rocky or sandy places; Me. to Minn., s. to Fla., Tex., Ariz., C. Amer., and W.I.